An open community discussion with the book's author, Richard Rothstein, will take place on January 28, 2019 at First Baptist Church - West Sanctuary from 7 pm - 9 pm. 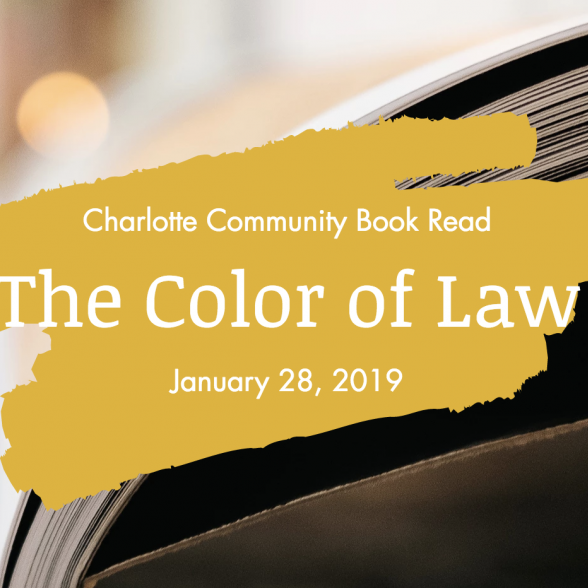 The goal of the Community Book Read is through education and ongoing discussion, Charlotte will be able to make better choices regarding the public and private policy that effects housing. The panel includes: Glenn Burkins — Moderator, Editor/Publisher of QCitymetro.com, Richard Rothstein — Author of The Color of Law, Willie Griffin — Museum of the New South, Arthur Griffin — Black Political Caucus Chair & former School Board Chair, Julie Porter — Charlotte Mecklenburg Housing Partnership, Greg Jarrell — West Side Community Land Trust & Mark Jerrell — County Commissioner District 4.